Last year a woman came to me for help. Before that she had been desperate to stop her Rotti mix, Mason, from behaving badly and found a “boot camp” style trainer that promised to rehabilitate her dog. Upon meeting Mason, the man put a choke collar on the dog, and after Mason growled, the man hung him from his neck off of the tailgate of a truck. Amazingly, his only physical injury was tracheal damage, but emotionally Mason was heavily scarred. He suffered through a handful of sessions, as the woman still believed that a heavy hand was needed for such a big and powerful breed. Eventually though, she realized that the man was abusing Mason, and she filed a complaint with local humane society. Over time, with a complete change in working WITH Mason rather than AGAINST him, not only did he make significant positive changes, his owner was relieved that she didn’t have to use force and punishment to address his fears. So, why am I telling you this story, if this blog post is about “calm assertive energy?” Well, one popular television icon associated with dog training has coined the phrase and his reach is far and wide. I often see the phrase splashed on websites and marketing materials from those that follow that belief. In fact, if you’re a dog guardian, you’ve likely heard the phrase “calm assertive energy,” because it is so readily used—especially when talking about fixing behavior problems, as it was with Mason. 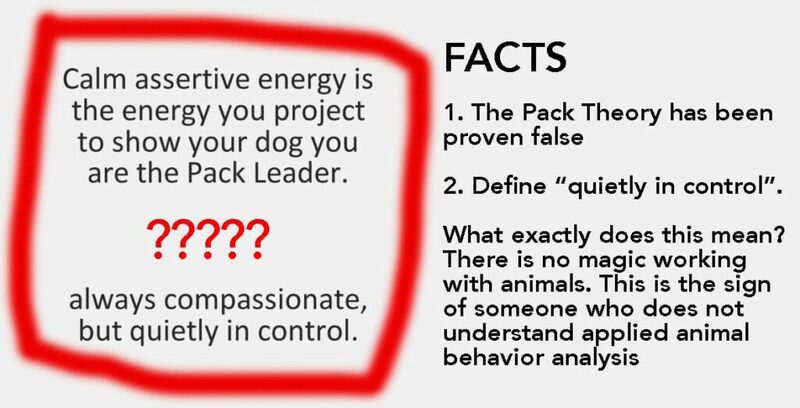 If you’re looking to actually make lasting behaviour changes with your dog or a clients’ dog, allow me to walk you through the reasoning behind why you should tuck tail and run the other way if someone tells you that you should have “calm assertive energy” with your dog. What does “calm assertive energy” actually mean? You tell me. It leaves for a lot of interpretation. Calm could mean one thing to one person and another thing to someone else. The definition of assertive is “having or showing a confident and forceful personality.” So, if I remain calm and confident but I am forceful with my dog, they will change what I want them to change? Your dog doesn’t care about your energy/aura/mystical presence. While we’re on the topic of “energy,” let me relieve you of one burden: severe behaviour problems are not due to your energy. It doesn’t help things if you are extremely stressed or anxious when trying to work with your dog; however, your aura is not what got you to where you are today. If your dog reacts aggressively towards other dogs or toward people, it’s not because you weren’t being Zen enough around him. There are so many variables that contribute to reactivity, and the way we fix it is to address and modify the way your pup feels about things that set him off. We fix the problem by teaching him that something he once perceived negatively is now a good thing. Change the emotional response, and the problem goes away. A thorough behaviour change program including training plans and, often times, working with both a veterinarian and a behaviour consultant is necessary. 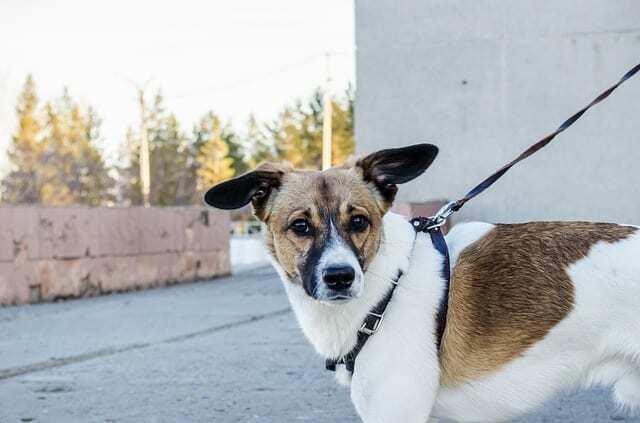 Asserting your presence or strength by using force will only weaken the relationship you have with your dog and often times suppress true behaviour which will result in worsening the issue—just like we saw in poor Mason. It perpetuates a dangerous behaviour myth. Assertiveness relates to the dominance myth—that we’re in a power struggle with our dog, and we need to show him who is the boss. This is not only a falsehood; worse than that, it leads us down a dangerous path of using force and coercion to change behaviour. There is plenty of scientific evidence to accurately identify that dogs are NOT trying to assume an alpha position and that asserting dominance will not solve your problems. Beyond that, it can actually cause your dog to become aggressive, as a study led by University of Pennsylvania researcher Meghan E. Herron demonstrated. It doesn’t help you, or your dog. My goal as a trainer and behaviour consultant is to help you define the problem you are having and to give you a clear training plan to get there. We change parameters based on measurable results. There’s nothing murky about how this is executed. As a client, you deserve to spend your hard earned money on a service that actually gives you a clear path for behaviour modification.